January 29, 2015 /3BL Media/ - Cox Communications has opened up more than 1,200 hotspots to the public for free, unlimited use during Super Bowl XLIX week and is adding additional temporary hotspots to high traffic areas to help keep Valley residents and tourists connected. In addition to the existing Cox WiFi hotspots located throughout the Valley, in places like the tailgating parking lots at University of Phoenix Stadium, additional hotspots have been installed at Downtown Phoenix's Super Bowl Central and Fan Fest Scottsdale. 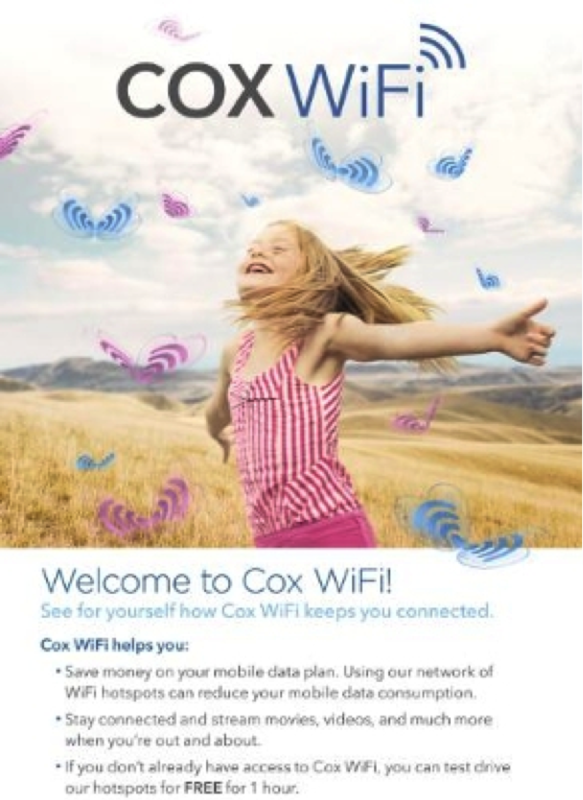 "Cox's Valley wide CableWiFi network helps our internet customers stay connected while on the go, and we are pleased to be able to open this network up to all valley residents and visitors during this exciting week," said John Wolfe, senior vice president and southwest region manager. Cox activated the 1,200 WiFi Hotspots late last year, with additional hotspots being added monthly. The WiFi activation came on the heels of the company's gigabit internet speed launch in thePhoenix Metro area, offering consumers speeds 100 times faster than the average speed in the market today. Cox has offered gigabit services for businesses for more than a decade nationwide and extended the capabilities to homes in Phoenix and Orange County, California this fall, with plans to offer in all its markets by the end of 2016. Downtown Phoenix Super Bowl Central: Just north of US Airways Center between Jefferson and Monroe Streets, East of 1st Avenue to 5th Street. Fan Fest Scottsdale: Just north of Scottsdale Fashion Square and east of Harkins Camelview Theatres on Goldwater. Fans tailgating at the big game will be able to access Cox WiFi hotspots while tailgating at the East and West parking lots, just south of University of Phoenix Stadium. Cox Wi-Fi hotspots can also be found by entering a user's location at www.cox.com/hotspots. Users can also click on a Wi-Fi icon on the map or download the Cox Connect app for iPhone and Android devices to immediately access directions to or from the specific WiFi hotspot address. Once a user has logged onto a Cox Wi-Fi or Cable Wi-Fi hotspot, his or her wireless device will automatically recognize and logon to other Cox Wi-Fi and Cable Wi-Fi hotspots for up to two years. Subscribers to Cox's Preferred, Premier, Ultimate and GIGABLAST Internet packages in Phoenix, Las Vegas, Northern Virginia,Connecticut, Omaha and Sun Valley, Idaho have free access to CoxWiFi as part of their service. And non-subscribers are invited to try Cox WiFi for free for one hour. For the Super Bowl, the hotspots are temporarily available to all for unlimited use. For more information, visit the Cox Wi-Fi homepage at www.cox.com/wifi.